Culbokie has been visited or occupied by man for several thousand years so was obviously thought to be a good place to live. 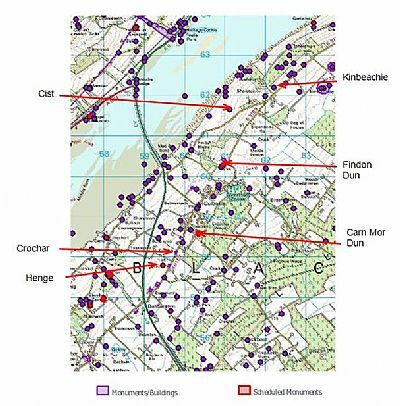 The map below reproduced from the Highland HER web site gives a clear indication of the range of archeological sites around Culbokie. Findon Dun - the Canmore record erroneously refers to this as "Findon Cottage" as the correct location is Findon Mill. Crochar - the Highland Historic Environment Record for "Crochar" does not refer to 'our' Crochar. Kinbeachie: On the map above the label "Kinbeachie" points to the location at the farm where excavations took place in 2003 by J. Wordsworth. Kinbeachie Castle: This is located at the extreme right hand edge of the map above just below the red arrow.